France’s famous landmark, the medieval cathedral of Notre-Dame is engulfed by a major fire. According to the officials the 850-year-old Gothic building’s spire and roof have collapsed however the main structure including the two bell towers were saved. Teams have been assigned to salvage the artwork stored inside and the firefighters still worked to contain the blaze. The reason behind the fire is still not clear and the officials remarked that it could be linked to the renovation works that started off after cracks formed in the stone. This sparked fears that the structure could become unstable and President Emmanuel Macron called it a ‘terrible tragedy’. He said that the ‘worst had been avoided’ and an international fund raising campaign will be launched to rebuild the cathedral. An inquiry was opened by the Paris prosector’s office into the ‘accidental destruction by fire’ .It was found that a firefighter was seriously injured while tackling the blaze. At around 18:30( 16:30 GMT ) the fire started and reached the roof of the roof of the cathedral, it destroyed the stained-glass windows and wooden interior before toppling the spire. To prevent the bell towers from collapsing 500 firefighter worked and after four hours the fire Jean-Claude Gallet said that the main structure has been ‘saved and preserved’ from complete destruction. 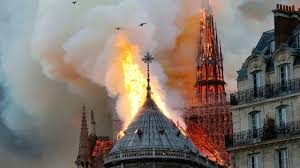 Deputy Paris Mayor Emmanuel Gregoire mentioned that the building had suffered “colossal damages” and they were working to save the cathedral’s remaining artwork. The Vatican prayed for the French fire services while expressing shock and sadness. Calling Notre-Dame a symbol of French and European culture , Germany’s Chancellor Angela Merkel extended support to the people of France. US President Donald Trump on Twitter wrote it was ‘horrible to watch’ the UK Prime Minister Theresa May said in a tweet that her My thoughts are with the people of France tonight and with the emergency services who are fighting the terrible blaze at Notre-Dame cathedral.